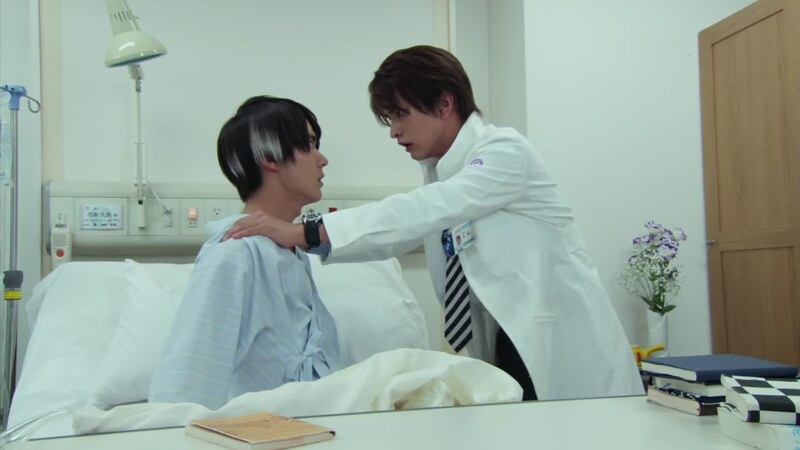 Hiiro checks on his patient Taiga and is very respectful, using honorifics and everything. Nico and Emu come in and comment how it’s very strange to hear. Taiga tells Hiiro to just go back to how they were before. 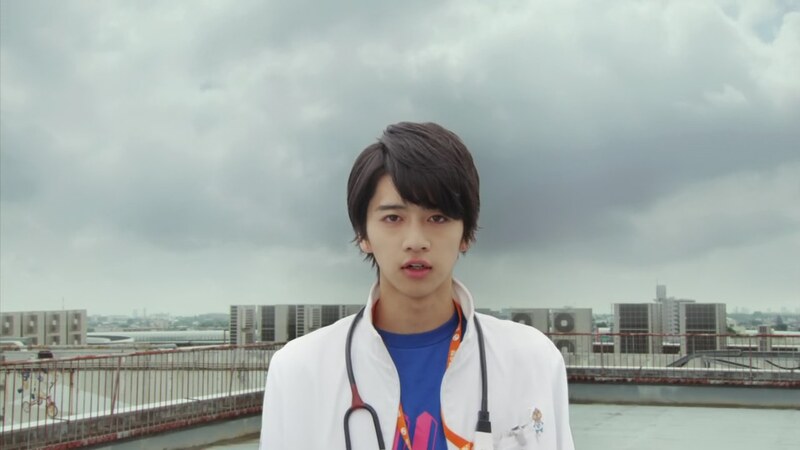 They get an emergency call, but Emu tells Hiiro to stay with Taiga for now. Parado and Graphite are in the forest, sick of being mocked by Papa Dan. Speaking of, he appears, ready to finish them off for good, especially Parado which will then render Emu useless. Papa Dan knocks their Gashats out of their hands and hits pause. But Graphite is able to move thanks to Gamedeus and kicks the button to resume. Parado picks up his Gashat as Papa Dan kicks Graphite into a tree. Parado henshins, but he appears to be no match for Papa Dan. Parado’s gauge empties to zero and he suddenly has flashes of drowning in water as Papa Dan continues to attack. Parado is trembling, but he manages to get out of the way of Papa Dan’s finisher. He is forced to dehenshin. Parado is sweating bullets as Emu and Poppysuna finally arrive even though they were just a few yards away. Papa Dan reveals that he has infected Nico with Gamedeus strand of Game Disease since she is the Ride Player closest to beating Chronicle as well as being their ally. So if they want to save Nico, they must defeat Gamedeus and to defeat Gamedeus, they will need to defeat Parado. If they do, Papa Dan will be more than happy to give them Knockout Punch’s Gashat trophy. In fact, he gives them the Tokimeki Crisis Gashat right now. Papa Dan zooms toward Parado to remind him that his sole purpose of existence is to be killed by humans. Meanwhile, having found Nico overwhelmed by Game Disease, Kiriya and Kuroto bring her to the CR room. 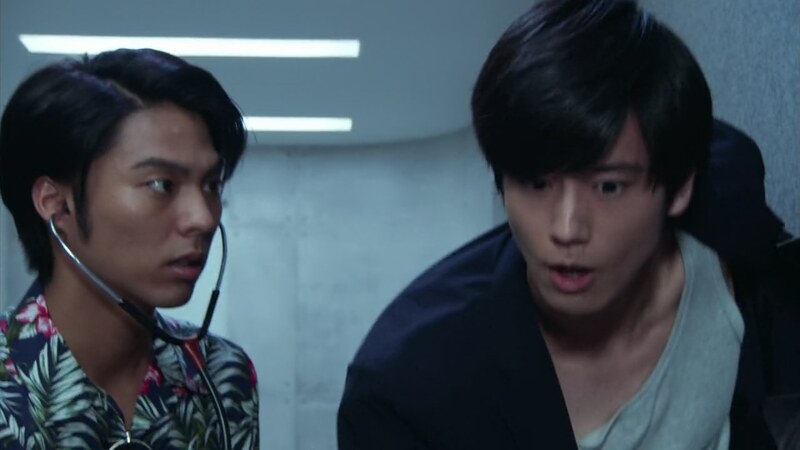 While Kiriya tries to keep Nico’s spirits up, Kuroto bluntly says they won’t be able to beat Gamedeus without Emu losing his ability to henshin. Kuroto approaches Nico and half-joking says it’s okay if she dies since she can just come back as a Bugster like him and Kiriya. Back at the forest, Parado asks Emu why he saved him. Poppysuna explains how Parado is actually very important to Emu. Parado scoffs at the idea that he needed any help in the first place, but Emu knows he is afraid. I will beat Chronus, Parado says. But Emu insists that he cannot. Parado refuses to accept that he was born only to be killed by humans. “I am the protagonist of Kamen Rider Chronicle,” he says. Upon hearing this, Emu runs off. Poppysuna follows. Papa Dan is pretty satisfied with himself and the dilemma he’s created for Emu, sure that it will work to his favor. Just then, Papa Dan gets a call about an overseas distributor who is probably a character from the upcoming movie and irrelevant to the series itself. Anyway, Kiriya calls Hiiro to tell him about Nico. 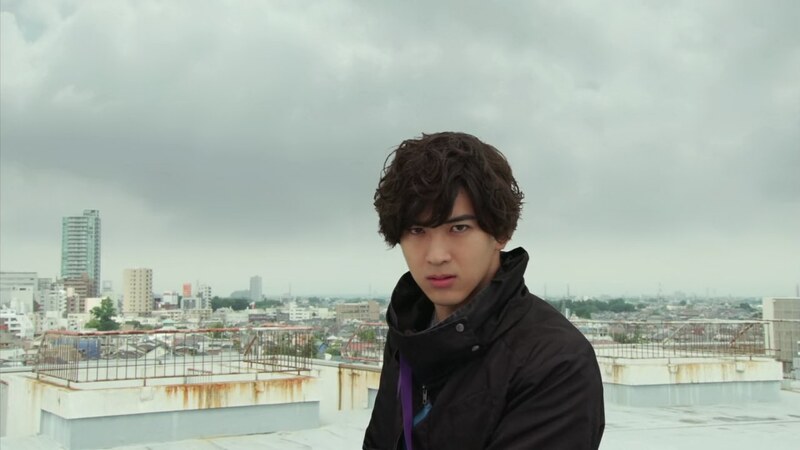 Taiga already knows something’s up when Hiiro tries to excuse himself. Taiga rips the IV out of his arm (Ow!) and gets up out of bed. He wants to go treat Nico himself, but Hiiro tries to stop him. 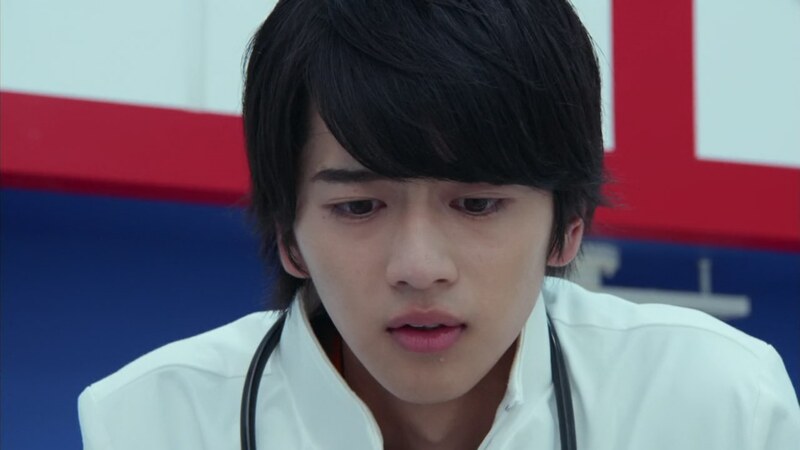 Hiiro says Taiga must think of himself right now especially when there are many others who are also concerned for Nico. Emu and Poppysuna hurry back to the CR. Kiriya tells them this strain of Game Disease is more serious than usual. Poppysuna and Kiriya leave the room as Nico apologizes for the way she treated Emu before she knew it was Parado who beat her at the tournament. Emu says it’s alright. But Nico struggles to hold back tears as she admits that she does not want to die. That causes Emu to remember the day of his accident. He tells Nico it’ll be okay and promises to get her smile back. Parado demands Graphite give him the Bug Visor, but he wants them to go together. Parado pins Graphite against the fence, but he suddenly gets flashes of the drowning scene again. Parado picks himself up off the ground and limps forward, saying he will defeat Chronus alone. 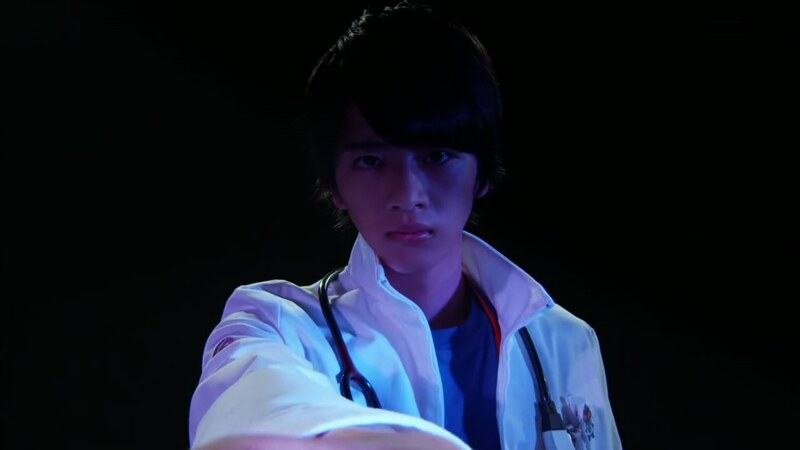 Emu asks Kuroto if destroying Papa Dan’s Rider Chronicle Gashat and shutting down Chronicle will cure all the patients. Kuroto says he has no idea. Emu demands Kuroto give him answers, but Kuroto just says her data is backed up anyway, so it’s alright. He adds that Emu should just focus on finding a way to defeat Chronus. Parado is on a rooftop, psyching himself up to take on Chronus. 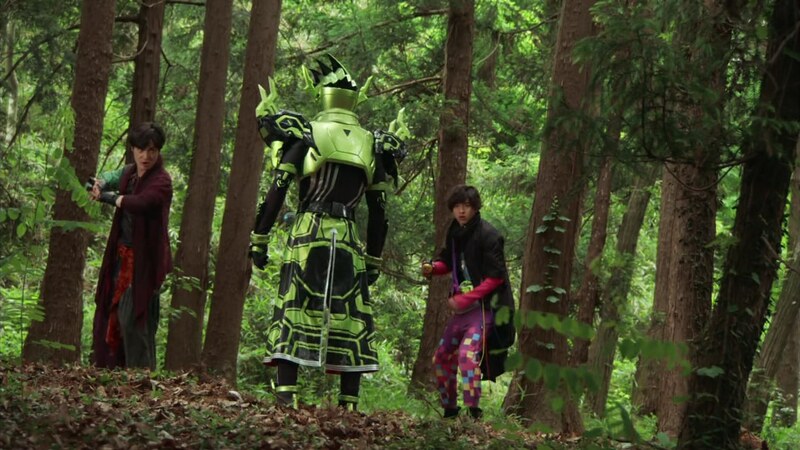 But Emu appears behind him. Emu tells Parado to admit that he is truly afraid of Chronus. Parado denies it, but Emu realizes he’s trembling. He says it is only natural to be afraid of death and proceeds to recount his accident from 16 years ago. Emu had begun feeling the effects of Game Disease then collapsed at the crosswalk and got run over. Emu says he more interested in Nico, the patient, than him. Emu wants to settle the score with Parado right here and now. Parado would love that. Parado and Emu both henshin and they battle. Emu asserts that Parado will never be able to beat him. Parado does not give up and continues trying, but he doesn’t seem to be any match for maxEmu. Parado’s guage is empty. He says he’ll be able to beat Emu next time. He starts to disappear, but Emu grabs him before he does. Parado is shocked. Kuroto and Poppysuna arrive, also surprised by what Emu is doing. Emu activates his finisher. Kuroto implores him to calm down and says that yes, all patients will be cured if they destroy the Chronicle Gashat. 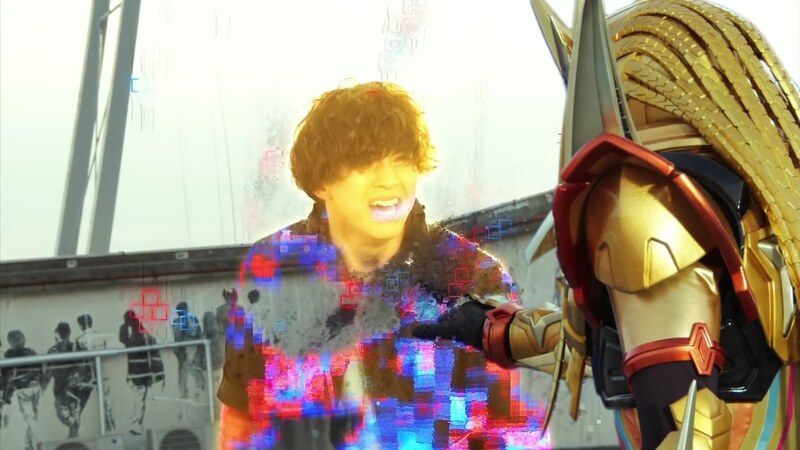 But Emu disregards Kuroto’s warning and delivers a Hyper Critical Sparking at Parado. Parado does his best to try and counter the attack, but it’s a futile attempt. 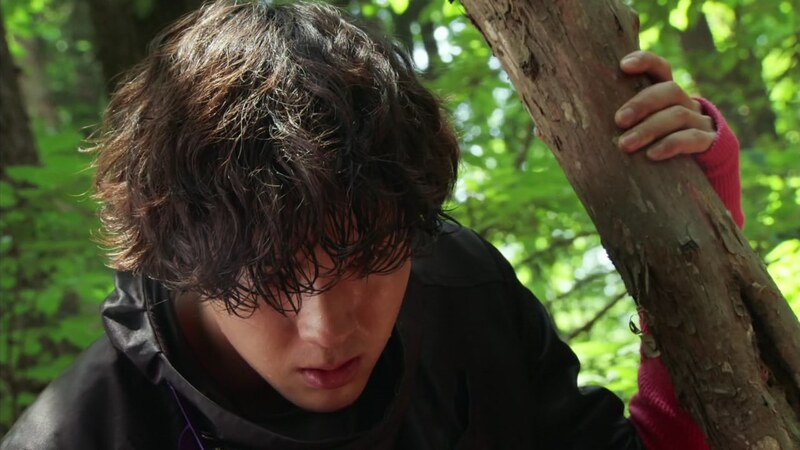 Parado suddenly has his life (and Emu’s) flashing before his eyes before Emu tells him “Sayonara… Parado” and lets go of his hand into the water. Poppysuna collapses to the ground. Emu clenches first. Interesting episode. Definitely felt more like a setup episode because I just know Parado isn’t dead. So it’s all about what’s going on in Emu’s head. And he’s been pretty messed up by so many people, who knows what’s going on there. But I guess we’ll find out next week. I very much enjoyed seeing Parado’s inner(?) struggle even though the foundation for it isn’t too strong. Recapping what we know, Parado doesn’t like being the pawn of a video game. He wants to be the protagonist, not some game piece that exists for the sole purpose of getting killed. We also know that he wants to play with Emu who has continually rejected him. So that’s the foundation that we have for Parado. But this episode almost felt like it came from a completely different path. Fear of dying?! What? In a season about doctors and illness, that’s certainly a relevant theme. But I feel like it comes from nowhere for Parado, even though Shouma Kai definitely got me feeling very sad for Parado in all his scenes this ep. But Parado seemed more like some lonely child with no friends. Or had friends who would always leave him. He’s been used and abused. And only recently when he plays with his “friends” now does his heart race. That’s the only time he feels alive (! ), when he’s enjoying playing with his friends and having fun and not alone. 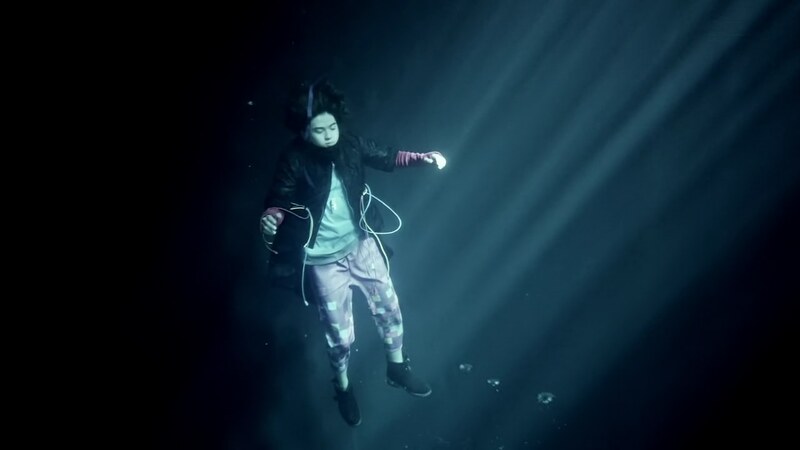 I’ve watched enough K-pop music videos to know drowning (while still looking very handsome or pretty) always illustrates a sense of loneliness. And when someone reaches out to you in the darkness, it represents hope. So I’m fully expecting (or setting myself up for disappointment!) 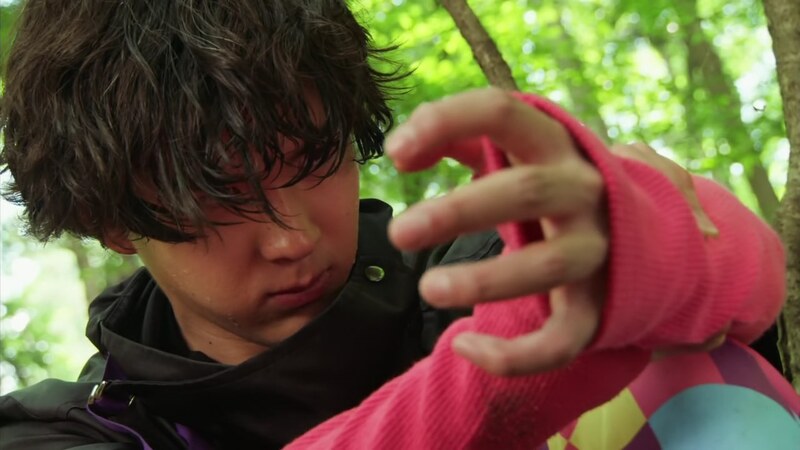 next episode to feature that hand reaching out to Emu when he almost died as a kid right before we see him, possibly, reaching out to Parado. So what all this really means, I have no idea. Promoting some kind of reset or reboot for next episode? That could mean anything too. Anyway, there’s still a lot of Ex-Aid to go and I’m hopeful. But depending on how things go, I might find myself feeling like how I did at the end of Drive where our Roidmude friends got excellent character development very, very late. Like, the episode they died-late. I don’t want that to happen to Parado (and to a lesser extent, Graphite) who also have had great potential that I feel is still waiting to be tapped into in the greater arc of the season. Elsewhere, I also liked Kuroto telling Nico that it’s okay if she dies since she can just come back as a Bugster. That’s the clearest and most direct line addressing that anyone who has “died” from the game and will ever revive just like Kuroto and Kiriya aren’t fully human. I feel like they’ve been unintentionally or not, very foggy with that detail. And so, like I’ve been harping on about for a couple episodes this season; the idea that doctors would bring people back to an artificial life is definitely an ethical and moral dilemma that could have possibly been touched on in the show. But now I think it’s too late to do so. 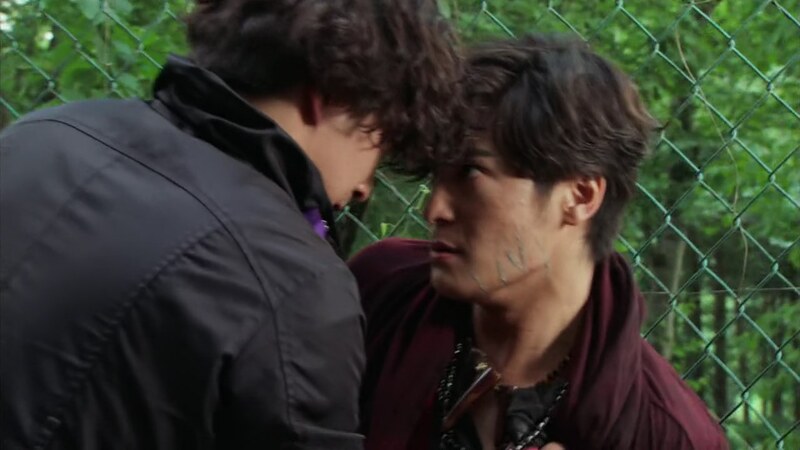 Anyway, I just hope Kiriya and Kuroto and anyone else who “dies” before then aren’t magically resurrected, for reals, like flesh and bone, at the end. It would really diminish what the season has been aiming for. Overall, a good episode that I hope is the setup for the bigger Episode 40 next week. The fear of dying did not come out of nowhere it was built up since tokimeki crisis was killed by Chronos. And before that he never had to worry about dying because he could always come back until Chronos came along. Also it’s been established that Parad and Emu are connected and share the same feelings. So you’ve those details completely went over your head.